The Mississippi runs between St Paul and Minneapolis. 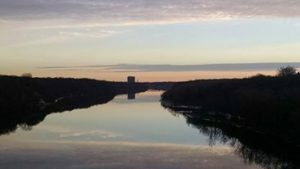 In fact they have coined this section of the River the “Metro Mississippi” – in stretches 75 miles from Elk River to Hastings, which means it’s a walking distance or a short drive away for many Twin Cities residents. Scores of people use the Mississippi River walk as their gym – in fact much of the Twin Cities Marathon winds around the beautiful river. The path is smooth, miles are marked and there’s plenty of space for cyclists, runner, walkers and even strollers! In the fall the colors are overwhelming! In the spring, you run a good chance of seeing an eagle – and might even lead you to his nest with eaglets. Winters can be crisp but without the leaves you can see for miles. Summer is bustling and the smell of wild flowers is mesmerizing. And if your idea of fun is more sedate, there are plenty of quiet places to sit. You can enjoy an adult beverage on the endless bridge of the Guthrie Theater. Glance out the windows of the Weisman Art Gallery – or even better glance at the iconic gallery from the shores of the West Bank. Or kick up your heels at St Paul’s Lower Landing.